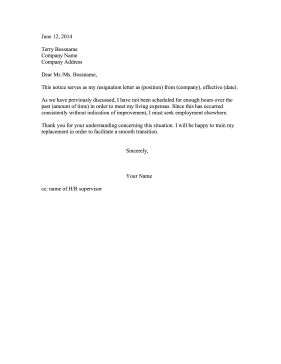 If there are not enough work hours scheduled to get by, use this printable resignation letter to reenter the job market. As we have previously discussed, I have not been scheduled for enough hours over the past (amount of time) in order to meet my living expenses. Since this has occurred consistently without indication of improvement, I must seek employment elsewhere. Thank you for your understanding concerning this situation. I will be happy to train my replacement in order to facilitate a smooth transition.